Let’s face it - there’s no avoiding candy or sweets during this time of the year. Whether you’re attending fall festivals, taking a family trip to Apple Hill or stumbling into the Halloween section at the grocery store, candy and sweets are on full display for the world--and your child--to see. That’s why we’ve partnered with Kids Care Dental & Orthodontics to share these five cavity-prevention tips for parents this fall. Develop good oral hygiene habits early on. Good oral hygiene habits such as brushing and flossing twice a day are effective in removing bacteria and leftover food particles that can create cavities in your little one’s mouth– and there’s no better time than now to teach them how to put attention on prevention. Watch the amount of sugary snacks consumed. We understand it takes time to develop healthy eating habits in children. Something to consider, particularly with snacks, is how long the food remains in the mouth and how it can impact teeth. For example, hard candy or mints stay in the mouth a longer and cause longer acid attacks on tooth enamel. Sugary snacks should be consumed in moderation. Set a good example for your kiddo. We know they’re watching mom and dad so we recommend making conscious decisions about the treats you eat. If you express your choice to eat treats that have little-to-no-sugar, they’re more likely to do the same. Plus, we all know how tempting sugary treats are when they’re within arm’s reach! Take your kid to get routine dental check-ups. This will allow dentists to identify small problems before they become big ones. Routine visits can also help your child have a lifetime of clean, healthy, giggly smiles. The American Academy of Pediatric Dental recommends all children be seen by a dentist by their 1st tooth or by their 1st birthday. 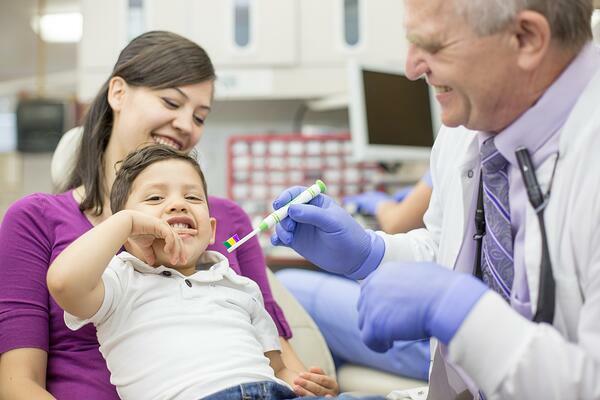 Instead of going to a general dentist, go to a kid-friendly dental office. This can make a huge difference for your kiddo. Usually the staff at kid-oriented dental offices have special training and they make kids feel more fun and less fear. Now is a good time to take advantage of dental insurance benefits before they expire at the end of 2018. If you’re looking for a top kids dentist in the Greater Sacramento Area, Kids Care Dental & Orthodontics is the place to go! They’re fanatical about creating a lifetime of happy smiles. That’s why they’re a practice for kids. They believe when kids grow up enjoying the dentist, healthy teeth and gums will follow. They’ve set up a different kind of dental practice that delivers fun, not fear. So your kids get stress-free dental visits - and beautiful, giggly smiles. Do you have questions about your child’s dental health? Want to book an appointment at one of their 14 Northern California locations? Visit kidscaredental.com!